Our editorial staff often discuss how to best use their mainstream digital cameras for astronomical imaging. Surprised? Truth is, many of the most amazing amateur celestial photos are captured with mainstream terrestrial DSLR cameras. As with traditional astrophotography, DSLRs offer lots of options for imaging solar eclipses. You can shoot the entire solar eclipse as a sequence of multiple images or target a single exposure of the moment of totality, the breathtaking “ring of fire” effect. However, you choose to use your DSLR to image the eclipse, be sure and practice a few days prior to the big event to make sure you work out any bugs! When using a DSLR for solar imaging, eye safety is still paramount. Don’t look through your camera viewfinder directly at the Sun without an appropriate solar filter. Also, by imaging the Sun without a filter, your risk permanently damaging your camera’s sensor, certainly not the result you want from imaging the Great American Solar Eclipse! For short-exposure photos, you can image with your DSLR supported on a tripod (with a solar filter attached to the camera lens, of course). For longer exposures, you’ll want to mount your DSLR on a special tracking device that compensates for the apparent movement of the Sun caused by Earth’s rotation. 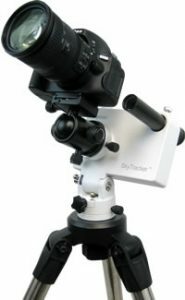 With a basic computerized telescope/ mount, you can image the eclipse through the telescope (with a filter attached) by attaching your DSLR to the telescope’s focuser using low-cost accessories such as a basic T-adapter, along with a T-ring specific to your camera model. The telescope mount’s built-in tracking will keep Sun’s image in the frame as long as you choose. Even though the eclipse is less than three weeks away, if you are starting with just your DSLR camera you still have time to get your gear together. First, a solar safe filter. Many astronomy retailers sell off the shelf filters that will fit many DSLR. Just do a search for DSLR solar filters and try to find a filter that fits your particular camera. Or, you can build your own filter. Gary Parkerson, Executive Editor of Astronomy Technology Today, has written a detailed article on building your own DYI solar filter for under $50. And for that $50 he actually built filters for four optical rigs including telescopes and binoculars. He uses Baader solar film available from Astro-Physics. Once you have your camera solar ready, you really should consider a tracking mount. There are several great (and inexpensive) options available. These include the Vixen Polarie Star Tracker which attaches to a standard camera tripod and can accept any digital camera weighing up to 7 lbs. Another great option is available from iOptron. 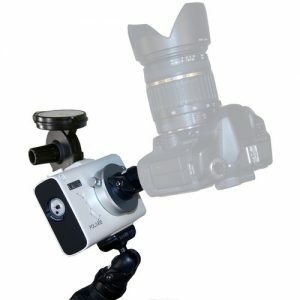 Their SkyTracker tracking camera mount also attaches to a standard camera tripod and can accept any digital camera weighing up to 7 lbs. And the great news is, once you get your camera outfitted for the eclipse, you’ll also be set to step into nighttime astroimaging! 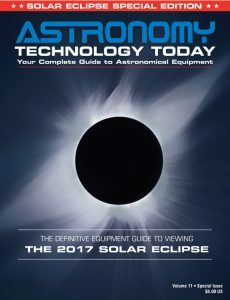 The American Astronomical Society (AAS) has created an excellent tutorial on using digital cameras to image the Great Solar Eclipse. In addition to providing an in-depth overview of using a digital camera during the event, they also provide links to numerous helpful sites that provide handy information, such as a shutter-speed calculator for solar eclipses and recommendations for ISO settings, f-stops and exposures. To view click here.